Research about the therapeutic effects of herbs and spices is enticing, but how does it translate to what you eat every day? Quite easily, as a matter of fact. It turns out that relatively small amounts of dried and fresh herbs and spices may have health benefits. For example, Heber says it’s reasonable to expect benefits from 1.5 teaspoons of ground cinnamon. Spread it throughout the day to make it most palatable. Capitalize on the potency of dried herbs and spices by purchasing brands with “Best By” dates on them, and storing them in airtight containers away from heat, moisture, and direct sunlight. Using fresh herbs or spices? Double the amount to get the same levels of active substances in their dried counterparts, Heber says. 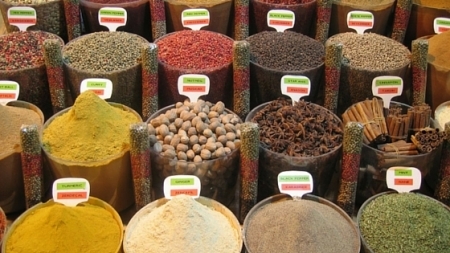 Tips on how to incorporate more herbs and spices into your favorite foods. You don’t need to make drastic changes in your eating plan to benefit from seasonings. Here’s how to incorporate more herbs and spices into your favorite foods. Ground cinnamon: Add 1.25 teaspoons to prepared oatmeal; 1 cup Greek yogurt mixed with 2 teaspoons molasses or honey, or artificial sweetener; and French toast batter. Sprinkle half a teaspoon of cinnamon over ground coffee before brewing. Top a fat-free latte or hot cocoa with ground cinnamon. Chili peppers: Add chopped peppers to chili, burgers, soups, stews, salsa, and egg dishes. Turmeric: Sprinkle on egg salad. Mix half a teaspoon turmeric with 1 cup Greek yogurt and use as a dip or sandwich spread. Add to chicken or seafood casseroles, and to water when cooking rice. Garlic: Add fresh chopped or minced garlic to pasta dishes, stir-fry dishes, pizza, fresh tomato sauce, and meat and poultry recipes. Oregano: Add 1/8 teaspoon dried to scrambled eggs, salad dressings, and store bought or homemade marinara sauce. Sprinkle some on top of pizza, and stir into black bean soup. Basil: Make a sandwich with low-fat mozzarella cheese, sliced tomatoes, and fresh basil leaves; add fresh leaves to green salads. Thyme: Sprinkle dried thyme onto cooked vegetables in place of butter or margarine. Add 1/8 teaspoon dried thyme to two scrambled eggs, and to salad dressings. Use it in a rub when cooking salmon. Add fresh thyme to chicken salad and chicken soup. Rosemary: Add dried crushed rosemary to mashed potatoes and vegetable omelets. Parsley: Add chopped flat leaf parsley to meatballs and meat loaf, and to bulgur salad. Ginger: Grate fresh ginger into quick bread batters and vinaigrette. Add chopped ginger to stir-fries. Sprinkle ground ginger on cooked carrots. Cloves: Sprinkle ground cloves on applesauce, add to quick bread batters, and add a pinch to hot tea.